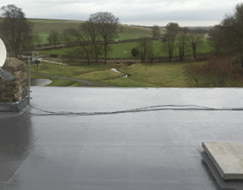 Fibreglass flat roofing systems offer a tough, robust roof covering for your property, with a high quality finish. Suitable for roof walkways or terraces due to its strength and sturdiness, we can offer a top quality installation of this type of roof. The product we use, ‘Tuff Stuff’ is one of the market’s leading brand and our staff are all qualified and experienced in fitting this product, so you can be certain that you will be left with a high quality roof covering. All fibreglass flat roofs also come with a 10 year guarantee.